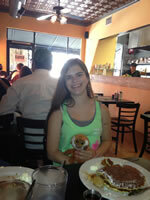 The morning after a Painted Turtle event in Hollywood, we decided to go to breakfast at a place called Eat. It was a nice small little place with indoor and outdoor seating. We were seated right away even though it was crowded, which was nice. There were so many good-sounding options that it was hard to decide what to get. My brother and I decided to try the buttermilk pancakes. There were many styles of pancakes, we went with powdered sugar and syrup. They came as three large pancakes, they were thin and still really soft. They weren’t too fluffy. My parents shared the Ned’s Benedict, they were perfectly poached eggs on an English muffin with tomatoes and avocado. it came with potatoes. The potatoes were great, especially the crispy parts. They said the hollandaise was great and the presentation was very nice. They also shared the breakfast burrito. It came with thinly sliced potatoes, eggs, green onion, and cheese with salsa on the side. My parents asked for no meat since we are pescetarians, and they offered avocado. I thought that was really nice of them. The burrito also came with Zucchini hash, which my parents loved. They were like hash browns but with zucchini. The service was great and was very friendly, we didn’t feel rushed at all. They serve breakfast all day. My mom noticed some dog bowls in the back patio. I thought that was really cool. Overall this is a great place to have breakfast or lunch with your family. I really want to go back there sometime. As you may have heard, our beloved camp, The Painted Turtle Camp, in Lake Hughes, CA was severely affected by the Powerhouse wildfire last June. Thankfully not major buildings were burned but because of the smoke and landscape damage, The Painted Turtle could not hold camp sessions this summer. So The Painted Turtle created “Camp On the Move” so that campers could still have a little camp fun this summer. My family attended a “Camp On the Move” in Atherton, CA. It was a great day with crafts, food, dancing and fun! 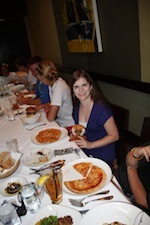 After the event, my family and many camp friends decided to go to Piacere for dinner. 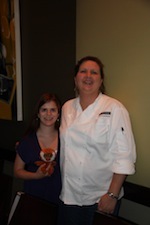 The chef of the restaurant is a good friend of ours and we have been wanting to try the restaurant for a long time. The front of the restaurant was a nice little bar and outdoor seating. We were seated in a large private room because of our large group. The service was very nice and attentive even though we had a large number of people. First they brought out some bruschetta. They were small slices of sourdough bread with tomato slices and balsamic drizzled on them. I’m not a very big fan of tomatoes so I let my dad have them. I love the flavor of tomatoes but I’m still learning to like the texture. The sourdough bread with the flavors of the tomato and balsamic was delicious. Everyone at the table enjoyed the bruschetta. Then they brought out some bread and dipping oil that was delicious! They also brought some seasoned, roasted garbanzo beans in their pod, that everyone loved. They were very unique and fun to try. I shared a Caesar salad with my mom. It had shaved parmesan and garlic croutons. The croutons were very flavorful and you could definitely taste the garlic. The shaved parmesan was rich and delicious and the dressing was light and perfect. I wished I had ordered my own. There were so many things on the menu that I wanted to try but I finally decided to try the cheese pizza, knowing my parents would let me try their entrees. The pizza was wonderful with a slightly sweet sauce and great crust. The mozzarella was delicious on the pizza. My brother said that it was “perfectly crispy”. We ordered a side of corn cakes. They were so good that I wish I could go back and have them right now. They were whole kernels of sweet and juicy corn in a light cake that was just the right amount of crispy. My family and friends enjoyed them very much. My mom loved her entrée which was the day boat scallops with a pea risotto. My dad loved his entrée too, which was a salmon with corn cakes and vegetables. From what I could gather, everyone at our table enjoyed their meals—everything from spaghetti and meatballs or gnocchi to mushroom pizza or burgers. At the end of our meal, after we’d said our goodbyes to our friends and went to thank the chef for our wonderful meal, she invited my brother and I to taste some of the house made ice cream. My brother’s favorite was the buttermilk. I couldn’t decide between chocolate or banana chocolate chip, both were wonderful. The chocolate was very rich and the banana chocolate chip reminded me of a banana chocolate chip muffin. The vanilla was very nice, it was like vanilla bean. All of the flavors were great. Overall, Piacere is a wonderful place to eat out. Their service is great and their food is amazing! 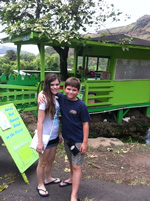 Piacere is a great place to go with family and friends and the kids would love it. I went to Boston with my history class. 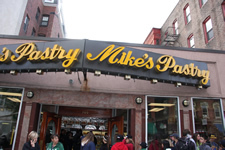 One of the ma ny places to eat was Mike’s Pastry Shop. 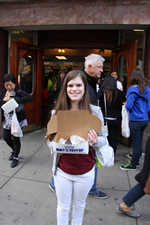 They had a huge glass case with everything from cookies to brownies, but their most famous item was their cannoli. They had many different kinds of cannoli like cookies and cream, Limón cello, and Espresso. I’ve never had a Cannoli before, and there were so many that it was hard to decide which one to try. I finally decided to try the chocolate covered cannoli. It had a chocolate covered crisp shell with sweet, thick cream. On the sides where the cream showed, there were mini chocolate chips. My mom let me taste hers, the Peanut Butter cannoli. It had a thin and crisp shell. It was filled with a thick cream that tasted just like peanut butter. I really enjoyed it. I think the rest of my class enjoyed theirs too. The cannoli were large and the shells were crispy and fresh. My brother is looking foward to trying the Peanut Butter cannoli when he goes to Boston. Overall, the shop is friendly and has a large variety of tempting treats. This is a really nice place to grab a treat with your family and friends. Our family visited the Alii Kula Lavender farm in Kula, Maui. It was beautiful. We walked around and saw the many different types of lavender and other native plants. The weather was cool and refreshing. The lavender flowers were alive with honey bees. There was a small gift shop and café near the lavender fields. Everything in the gift shop was made with lavender from lavender soaps to lavender seasoning. They offered a sample of lavender tea and I decided to try it. It was so good and soothing. In the café, we tried the lavender scone and lavender lemonade. The scone was large and soft with a a delicious hint of lavender flavor. It was served with lilikoi jam. I loved the jam! The lemonade was refreshing. We also tried a lavender chocolate brownie. It was so good! Also, because we completed the scavenger hunt, where we look for different types of plants and areas on the farm, we received a free treat. It was a lavender cookie. We all enjoyed it very much. We bought a lavender chocolate bar, but it didn’t last the whole way home. We shared it in the car and it was delicious! 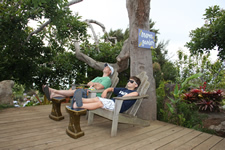 I think the Alii Kula Lavender farm is a great place to spend time with family, friends, or just to relax. It’s a part of Maui that is up in the hills and you might not visit but I recommend a visit! Our family went in search of some banana bread we had heard was good. We drove from Kaanapali up highway 30 to Kahakuloa. The road was windy with beautiful views but very narrow in places and parts were kinda scary to my grandma because there were places where only one car could fit on the road and there was a steep drop down to the water. When we finally got to Julia’s, it was a little green treehouse that was over a small creek. They had samples of dried mango, coconut candy, passion fruit butter and banana bread. I really liked the mango and the bread so we decided to get some. The bread was very very moist and delicious. It was worth the drive to get it. On the way back, there were some beautiful sites such as a blow hole and places to get out and look over the cliffs at the ocean. If you find yourself in Maui, and you are a brave driver, treat yourself to a nice drive up to Julia’s Banana Bread.